Diminutive Grant Grove features the third largest and one of the oldest of the sequoia trees, the eponymous General Grant Tree, as well as numerous historical relics and sequoia-related curiosities. What this hike lacks in size and scale, it more than makes up for with exceptional sequoias and both local and national historical sites. 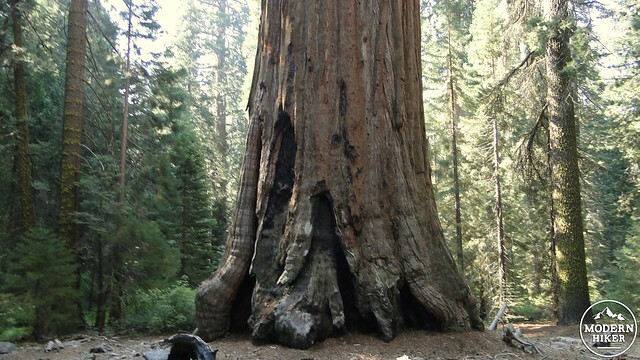 From the moment of discovery, sequoia trees were always a target for the logging industry due to their enormous size and potential yield of useful timber. 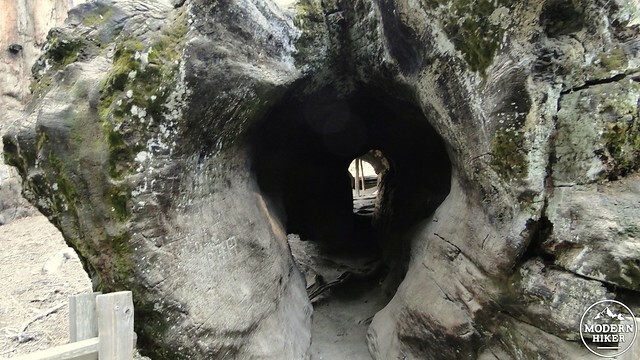 As European settlers began to move into the western Sierra, many loggers set their sites on sequoia groves and began to log them with startling efficiency. The nearby Big Stump, Cherry Gap, and Converse Basin groves were extensively logged during the latter half of the 19th century, and Grant Grove escaped the saw due to the Federal government setting aside 4 acres around the trees for protection. 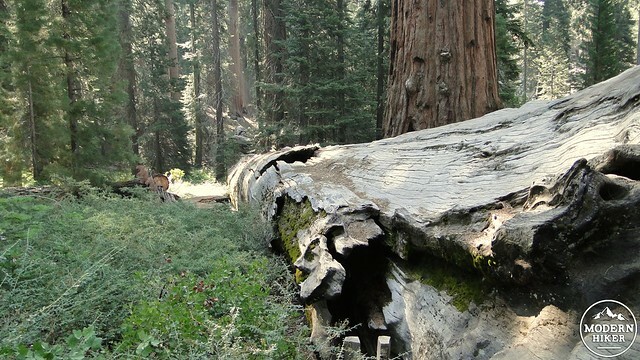 Sadly, sequoia timber is hard and brittle, and the trees generally shatter on impact. The average amount of recoverable wood from a downed tree was around 25%, and the timber was usually good for little else than shingles, fence posts, and toothpicks. Through the writing of John Muir and the efforts of local conservationists, General Grant Grove was set aside for protected status under the nascent National Park banner along with nearby Yosemite and Sequoia National Parks. Over the years, private interests, including the city of Los Angeles’ drive to create hydroelectric dams in the Kings and Kaweah watersheds, clashed with the stated goals of the National Parks. Fortunately, the National Parks have consistently won. This has done much to protect what is essentially a fairly pristine grove, although later visitors could not resist the temptation to vandalize trees. As a result, the larger trees of the grove, including General Grant, are fenced off. Grant Grove remained its own National Park for some time until 1940, when the much larger Kings Canyon region was designated for national park status. Because Grant Grove lies along the highway serving Kings Canyon as well as being part of the Kings watershed, the grove and several adjoining and nearby features, including Redwood Canyon, Buena Vista Peak, and Big Baldy Peak were included into the area, which was then included into the overarching Kings Canyon National Park, which was then of course run jointly with Sequoia National Park. It’s curious to see a national park containing two geographically separate sections that are so dramatically different, and it should be kept in mind that this part of Kings Canyon is about 90 minutes of driving from the actual Kings Canyon. 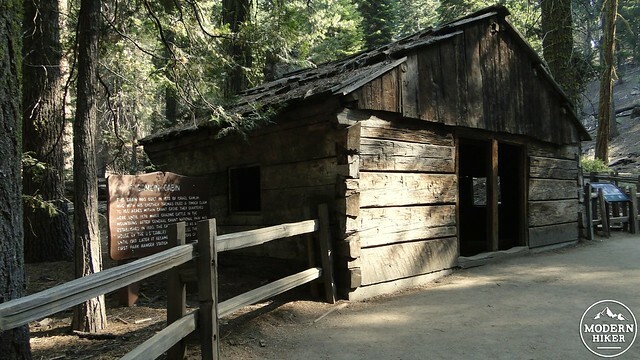 Within the grove, you will find a number of local historical curiosities, including a large stump from a logged tree upon which local residents would hold Sunday school classes, an old wooden cabin, and a hollowed-out sequoia log that doubles as a trail connector. This hike focuses on the short and easy loop hike within the grove, but it should be noted that the Grant Grove Loop connects to various other trails, including the Sunset Trail and North Boundary Trail. Both trails could be incorporated into a larger and more extensive hike, but as this loop visits the best trees and the most landmarks, this write-up will focus only on the loop. The .6 mile loop trail starts and ends at the General Grant parking lot at the end of General Grant Road. After parking your car, you will come upon two trails branching off to the left and to the right. Either trail will lead you back to the start, although this track will follow along on the left branch, heading clockwise. Immediately, you will notice that you are surrounded by towering sequoia trees, as well as massive sugar pines and white firs. The sugar pines in particular are enormous specimens of what is already the largest of the pine species, but these trees will be dwarfed by various massive sequoias, which reach a girth that has an area about the size of a garage or studio apartment. You will quickly come across a hollowed-out log known as Fallen Monarch, which doubles as a trail connector. You can see clear through to the other side of the log, and it is easy to walk through with only having to stoop in a couple of spots. It’s a curiosity now, but it has been used as a shelter, and, among other things, a saloon in the past. Farther along, you will come to the Centennial Stump, which was once the base of a sequoia that was cut down to be sent to the 1875 America’s Centennial Exhibition in Philadelphia. The tree had to be cut into sections to be transported on the train, and when it was reassembled, spectators in Philadelphia believed it a joke, dubbing it “the California hoax.” Hoax or not, had you been here 100 years ago, you could have attended Sunday school classes atop the stump. Next, you will come to Gamlin Cabin, which was originally built by a pair of cattle ranching brothers only to be passed into use as the headquarters for the General Grant National Park superintendent. 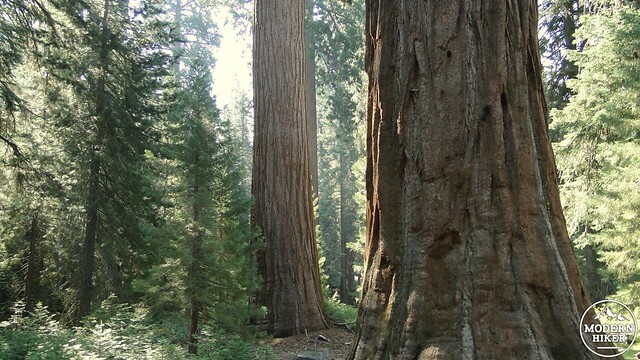 Meanwhile, you will be passing all kinds of significant, named sequoias, including the Oregon Tree, the California Tree, the Lincoln Tree, and the Twin Sisters. 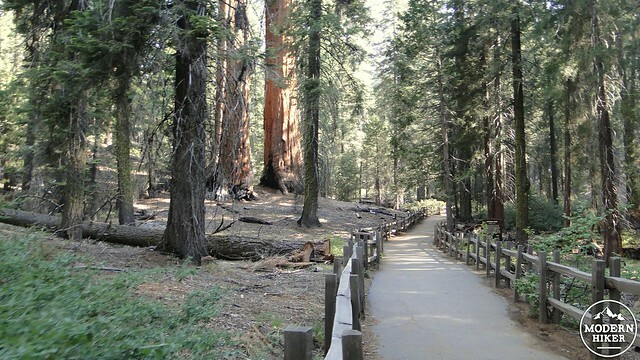 Some of these trees rank among the 50 largest sequoias, even though they all pale in comparison to General Grant, which is just around the corner. The next stop is a short meta-loop around General Grant Tree which allows visitors to admire the tree from different angles. 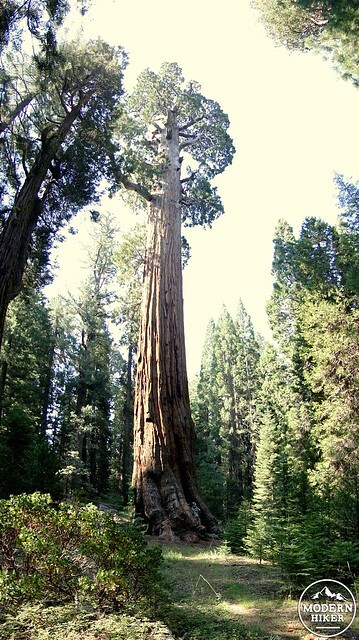 The tree is the third largest sequoia, after General Sherman and the President. It was once the second largest, but the President recently surpassed it. The tree is also dubbed “the Nation’s Christmas Tree,” and a Christmas wreath is often placed at the base. In 1956, President Eisenhower declared the tree a national shrine to those who have died in war, making it the only living object in the United States that serves as a memorial. Aside from occupying a place in the national consciousness, the tree simply occupies a lot of space, standing at 267 feet, with a basal diameter of 29 feet and an estimated volume of about 46,600 cubic feet. 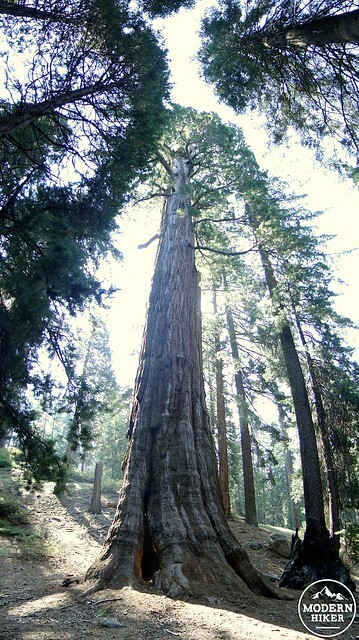 The tree is also estimated to be over 3,000 years old, making it one of the oldest sequoias in existence. The trail continues on from this living superlative to connect back to the beginning of the loop. The trail passes by a wide-angle viewpoint of the Grant Tree, as well as the smaller, but still remarkable Tennessee Tree (partially hollowed at the base) which is surrounded by a grove of dogwood trees that put out beautiful white blooms in late May and early June. After another pass at the Lincoln Tree, the trail will end where it began, and you will have completed the easy .6 mile loop. This is good one take on your way out of the park after a visit to some of the other area landmarks. It’s also an excellent hike for children or any other folks that may have limited stamina. It’s also a great place to learn about sequoias and initiate what becomes for many a lifelong love affair with the world’s most remarkable tree. The trail is paved from start to finish. It is also exceptionally easy to follow, provided you stay on the pavement and don't wander off on one of the trails leading away from the grove. Hiking does not get any easier than this. 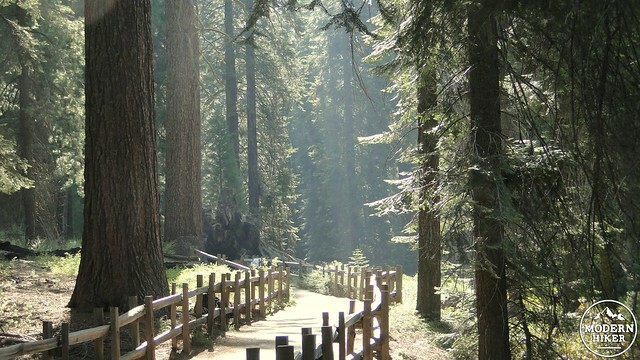 The nearest campground is Azalea, but other campgrounds such as Sunset and Crystal Springs in the Grant Grove area, plus Princess and both Stony Creek Campgrounds in the nearby Sequoia National Forest are also good options. From Fresno, take Highway 180 east toward Kings Canyon. At the junction with Generals Highway, turn right and follow the highway into Grant Grove Village. Turn right onto an unnamed road leading to General Grant Grove. Turn right to enter the parking lot.